Like other fellow Indians, the family is obsessed with Chinese food – hang on, better correct this to “Indo-Chinese” to acknowledge the fact that the Chinese food we eat in the motherland doesn’t taste anything like the real thing. Oh, we Indians love our ” Chinese”:our Gobi Manchurian – I don’t know what it is but it is delicious – our sweet and sour hakka noodles, our chow mein 62 (don’t even ask) and our pot rice – speaking of which, next time you are in Bombay do try out the pot rice at my favourite Ling’s Pavilion (husband and I got engaged there by the way, sealing the deal over some pot rice, yum!). But for the little person at home Chilli paneer is always the winner by a mile – the son just loves this stuff and the spicier the better. I have never ever made this at home and so when I was asked, or rather ordered, to rustle it up I adapted a Ken Hom recipe for Prawns in chilli sauce and substituted the prawns with Paneer (Indian cottage cheese) . Here is the original Ken Hom recipe. 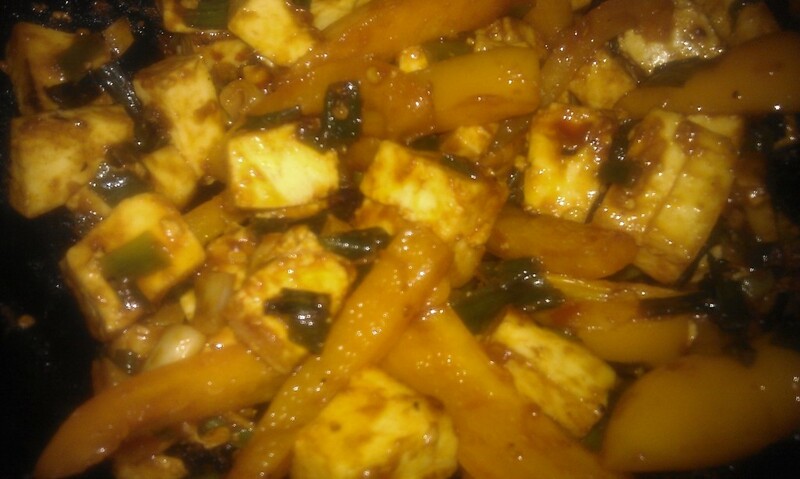 It was quite delicious, although next time I would coat the paneer in some kind of flour before frying to make the pieces crunchy. And no matter what the son says I WILL CONTINUE TO NOT ADD MSG. This entry was posted in Recipes from our kitchen and tagged Chilli Paneer, Indian food, indian recipe, Indian recipes, Indian vegetables, Indo Chinese, ken hom, ken hom's king prawn recipe, lings pavilion, recipes by Poornima. Bookmark the permalink.